This piece of plywood will be the subfloor for the breakfast nook seen beyond. 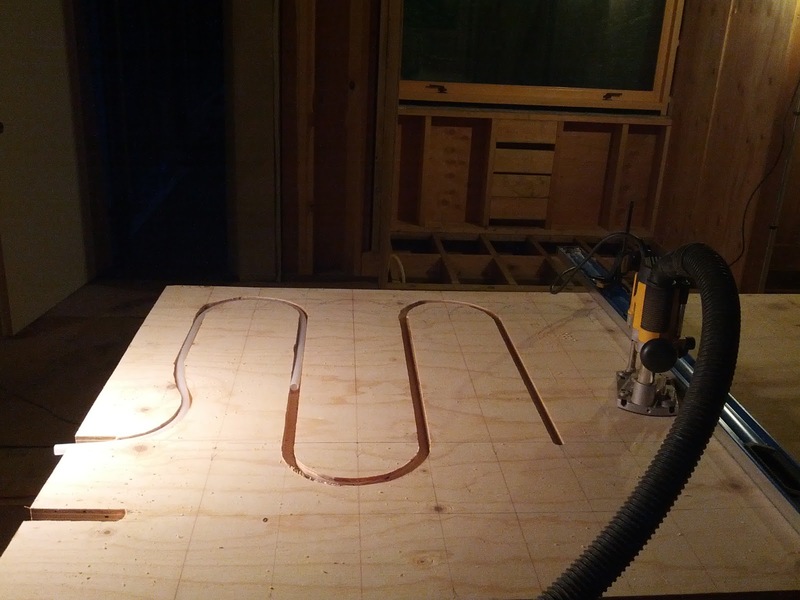 I'm using a router to cut channels in the 1 1/8" thick plywood. 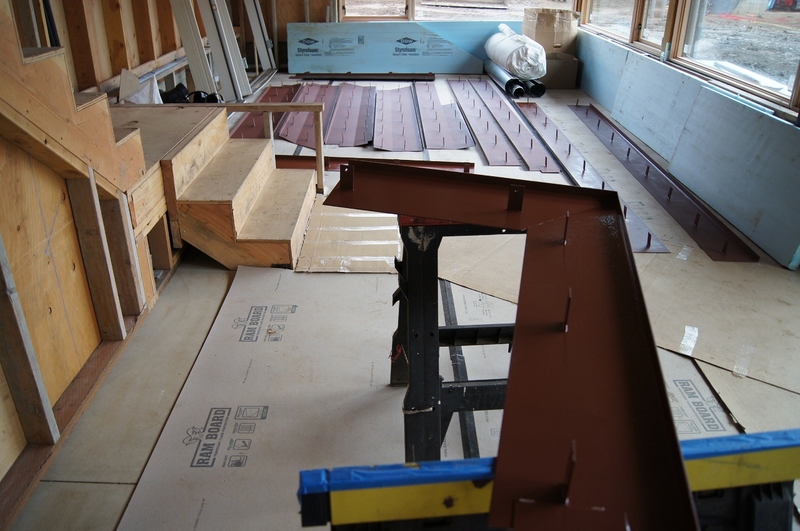 Radiant floor tubing will be placed in these channels to make sure the breakfast nook is nice and cosy in the winter. A piece of tubing is inside the channels on the left, making sure the bends are workable. 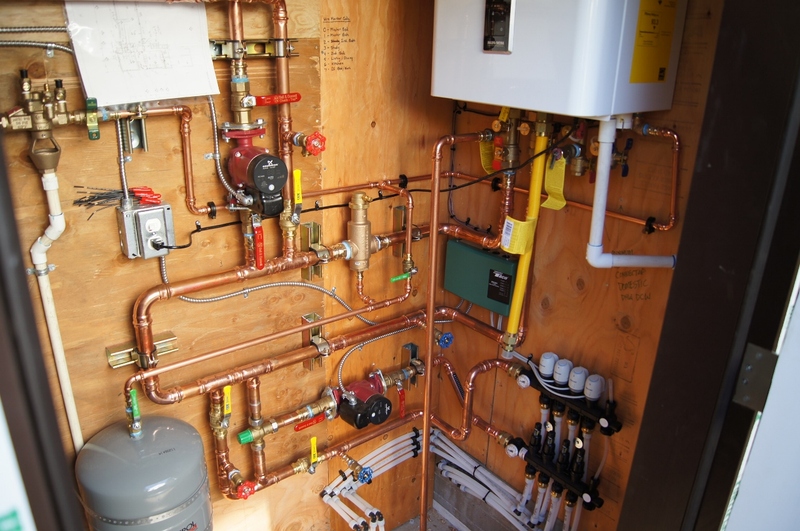 The finished flooring (fir) will cover this tubing, and insulation below it will direct the heat upwards. A first glimpse of the large awning window (custom from Versatile) can be seen beyond. Didn't get a chance to photograph the install. Now it huddles under a tarp until I get protective finish on it. A straightedge guides the router for the straight cuts, but the curves are freehand. A little bit of wonkiness is acceptable, I hope. 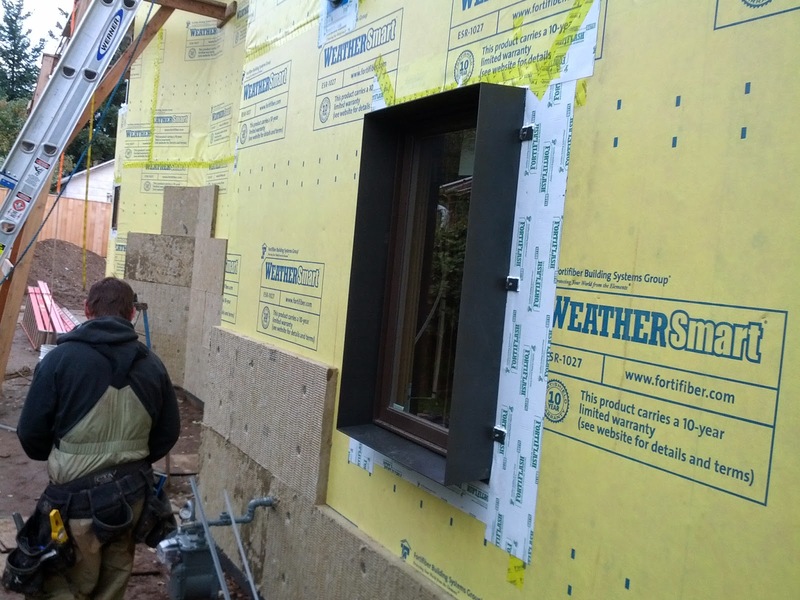 - The first of the exterior rockwool insulation was installed. 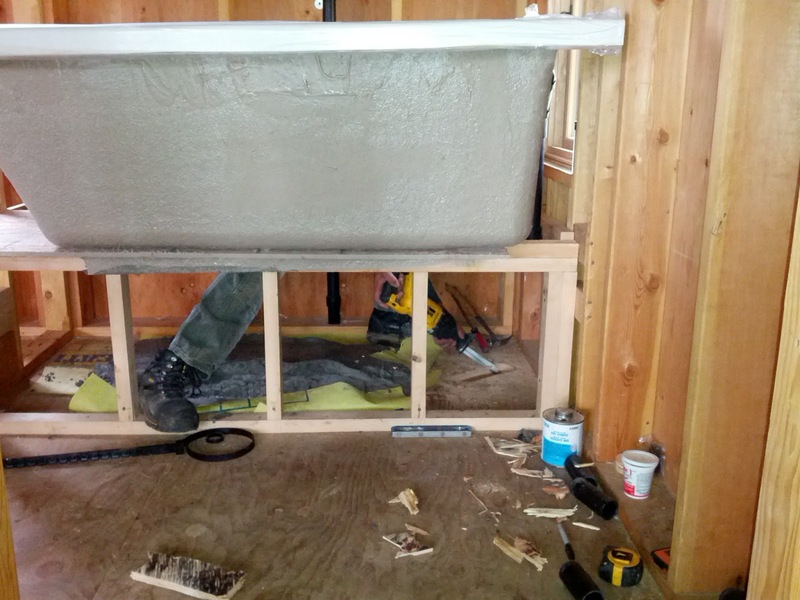 Just had to share this shot of the bathtub install. A bit of on-the-fly awkward adjustment process. 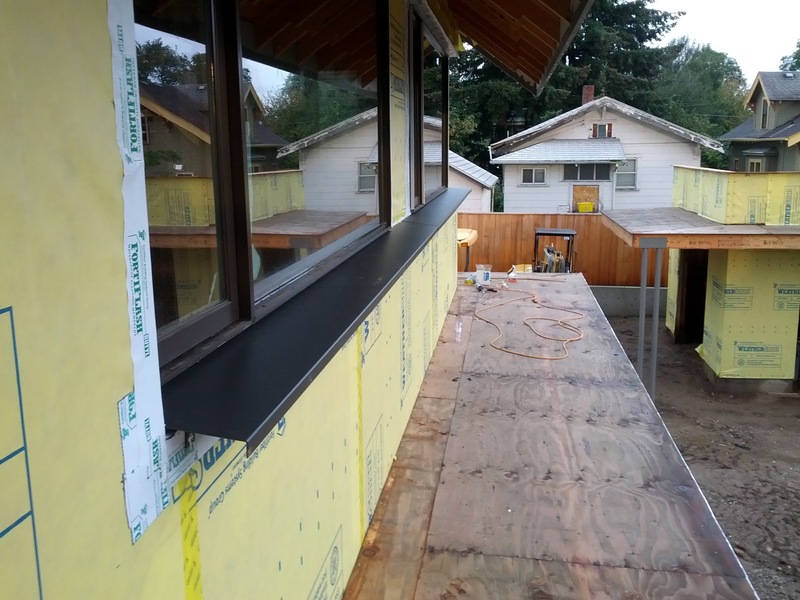 Remember those steel sills and copings here that I was painting? 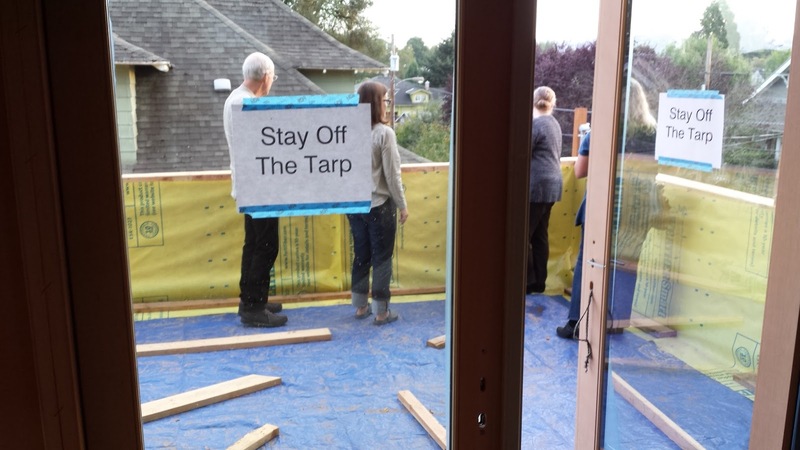 Today the weather broke long enough for me to install the first run of them along the master bedroom window 'slot'. 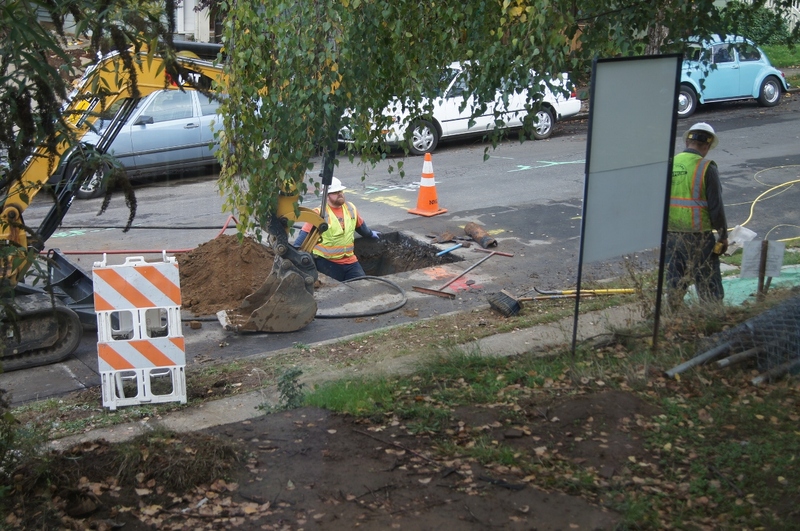 As part of the Mechanical System rough-in, the ERV has been installed. 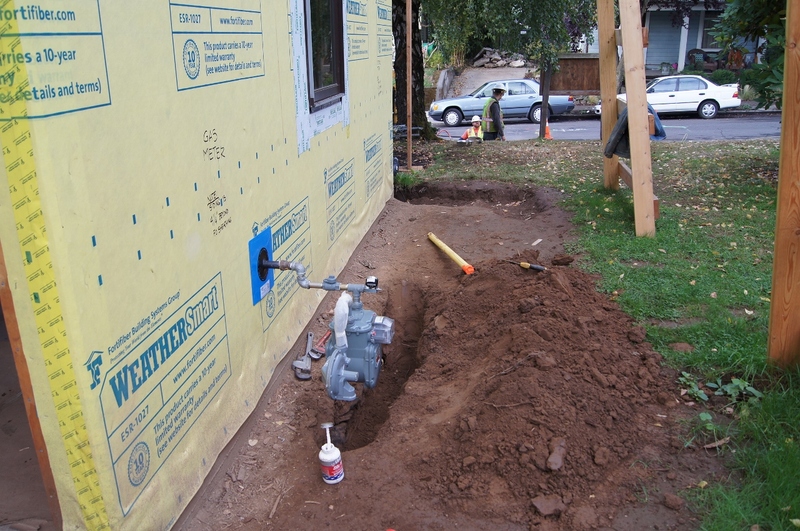 Plumbing rough-in continues at a good pace. One of the more visual aspects of this is the new tub! We are quite pleased with this tub. I would specify this again, no problem. Opening the box elicited oohs & ahs - a nice deep soaker. Here is a link to the item. 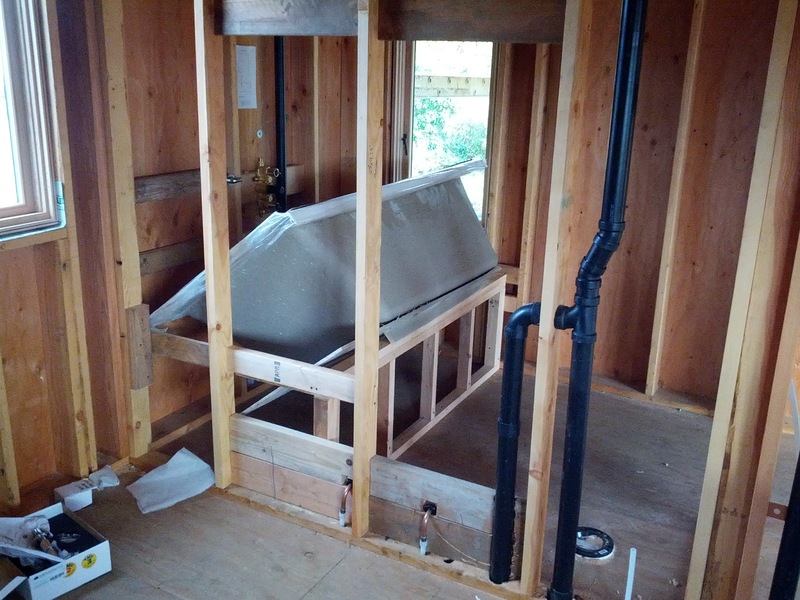 The tub is rocked up on its side so that the drain & overflow assembly can be installed first. Also, a grout bed will go down to give good solid support to the bottom. 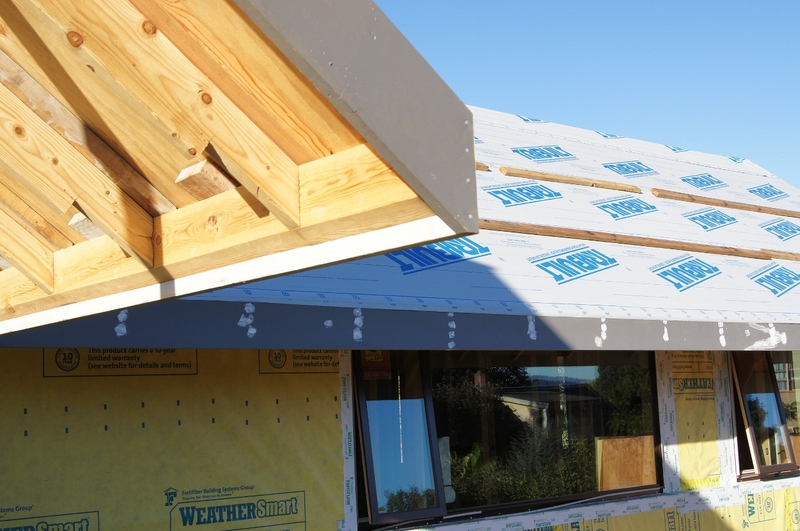 Then we get to see how well the framing wall & ledger I built will fit. Also visible in this picture is beefy blocking, low & high, to support our wall mounted vertical radiator. You can see the feeds poking through from the floor. 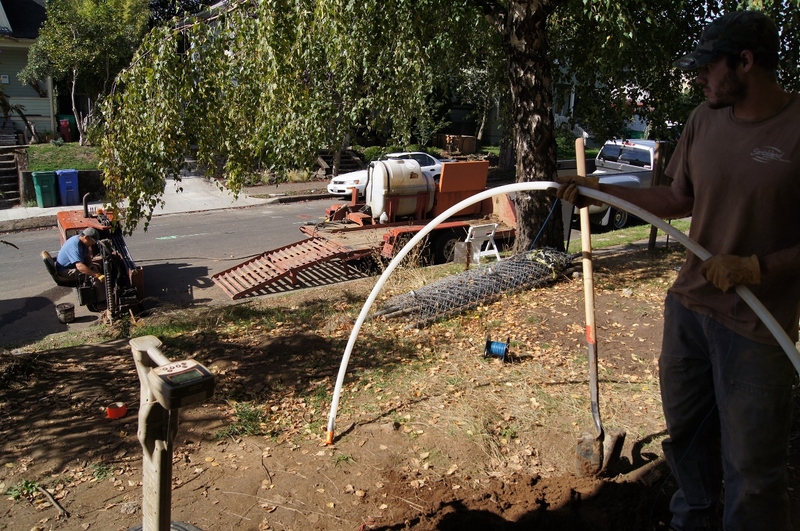 Portland Water Bureau showed up and gave us a water meter. 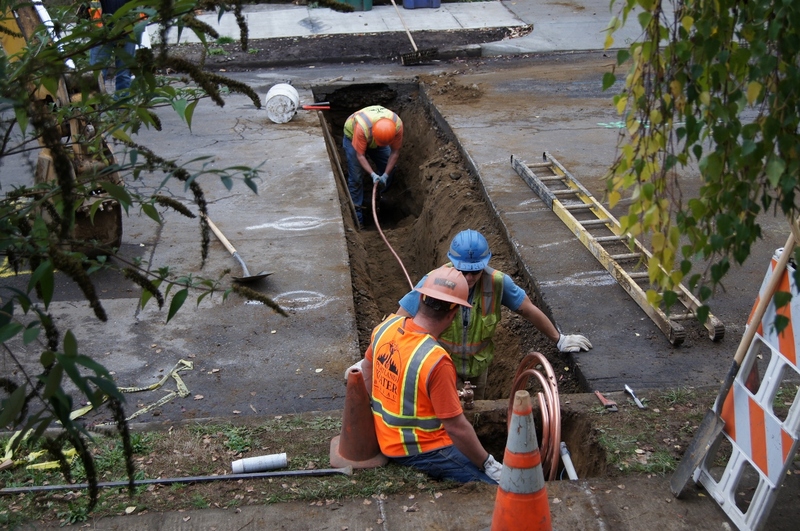 Today they connected the gas meter to the house piping, and connected it to the street. Now we're (on the way toward) cookin' with gas. G1: Ok, if you lose this bet, you have to wear a New York Yankees hat for a year. G2: No. I won't do it. A man has to have limits. The day came when the house needed to be connected to the outside world. 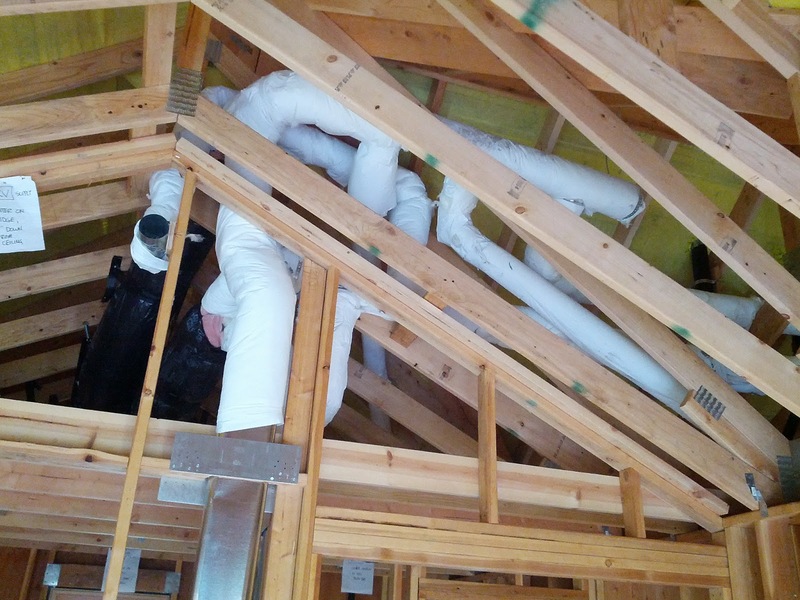 The past week was mostly about Heating and Ventilating. The framing crew did a fair amount of misc tasks, but hard to take a photo of. G1: "So what I don't understand is why Narcissists like to riot on May Day." G2: "Anarchists. I think you mean Anarchists." 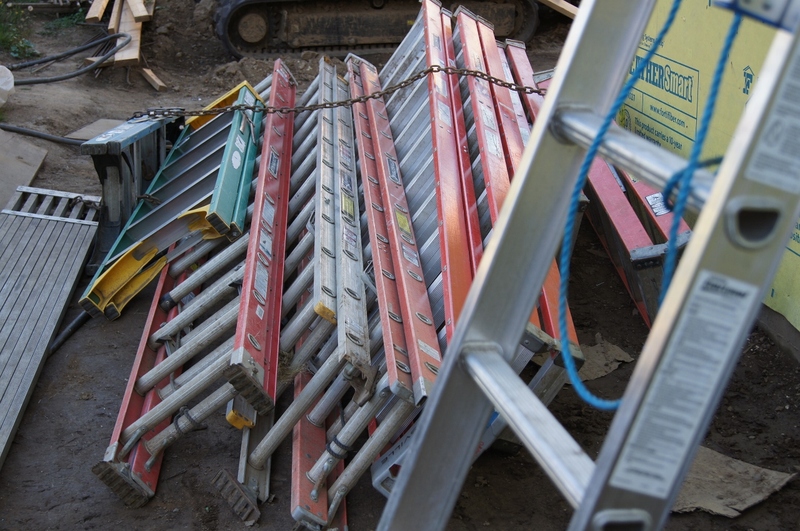 This is not even all of the ladders currently involved. Most of your clothes will quickly become 'project clothes'.